Democrat presidential candidate Sen. Elizabeth Warren spoke about her Christian faith during a CNN town hall in Mississippi Monday. With the cadence of a contemporary megachurch preacher and her experience as a Sunday school teacher, Warren explained why the pending judgement of the nations by Jesus, who will divide people into “sheep and goats,” is a driving force in her life. 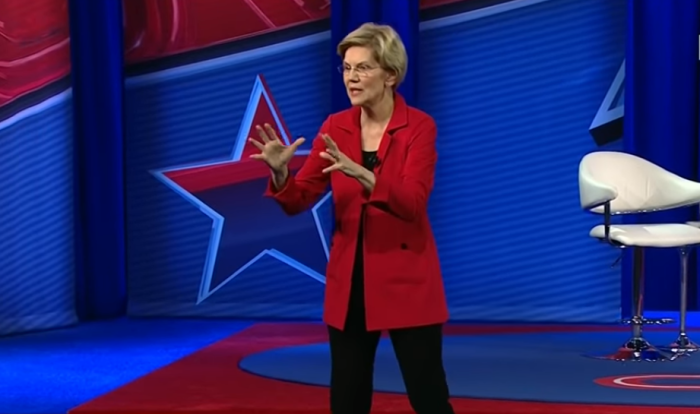 Responding to a question about what role does faith play in her life, Warren, during the hour-long town hall at Jackson State University, a historically black college in the state’s capital, first revealed to the audience that she was once a Sunday school teacher. “I was a fifth grade Sunday School teacher. All I can say is nobody got hurt,” she quipped to laughter in a recording of her response posted on Twitter. “It was a low bar for being a fifth grade Sunday school teacher at our church and I raised my children in a Methodist church. What it is for me is the importance of the lessons we learn when we remember our values, when we remember our faith,” she continued before delving into the judgement story. “The story for me is Matthew 26 and I’m sure some of you, a lot of you know this story,” she said incorrectly referencing the lesson of the judgement that comes in Matthew 25. “You know this is the one where the Shepherd is dividing the world into the sheep and the goats. And as we all know, sheep are going to heaven, goats they’re not. And the sheep asked Him, why us? Why us Lord? We look like those guys. And the Shepherd, the Lord answers back and says, ‘I was hungry and you gave me food. I was thirsty and you gave me water, I was in prison and you visited me. Naked and you clothed me. And as much as you have done it to one of these, the least of thy brethren, you have done it unto me.’ And what I hear in that is two things that guide me every day,” Warren said. “The first is there is God, there is value in every single human being,” the senator said to applause. “And the second is that we are called to action. That passage is not about you had a good thought and held on to it. You sat back and just thought about … things. It does not say you just didn’t hurt anybody and that’s good enough. It says you saw something wrong. You saw somebody who was thirsty. You saw somebody who was in prison. You saw their face. You saw somebody who was hungry and it moved you to act. I believe we are called on to act,” she ended in the clip to applause. Warren, a former Harvard law professor who launched her presidential campaign last month currently trails other Democrats such as Kamala Harris, Bernie Sanders and Joe Biden. Warren, who discussed a raft of policy ideas along with her faith, also said for the first time that she would support replacing the Electoral College with a national popular vote. Other issues she highlighted included the future of health care in America and a plan to break up tech giants like Amazon and Facebook. She also addressed a question about her claims to Native American heritage and the backlash from the claim.